Apple has launched the newer versions of the iPod Touch and the iPod Nano, along with the Apple iPhone 5 launch today, and the advancements made in the new versions are pretty awesome. The music players by Apple have got a total revamp, and here is some info about both of them. The 7th generation of the iPod Nano by Apple is the thinnest iPod ever with just the 5mm thickness, and a 2.5-inch screen that supports multi-touch. Not just this, but the support for bluetooth would make it possible for music lovers to listen to the music wirelessly using the bluetooth headphones. It gives 30 hours of non-stop music playback on a single charge cycle. There is a built-in FM receiver with live pause option. With built-in fitness features including a pedometer and support for Nike+, iPod Nano 7G users would have a better idea of where to take it along. 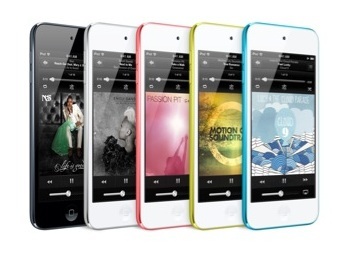 The iPod Nano will come in pink, yellow, blue, green, purple, silver and slate colors. The new iPod Touch comes with the screen that is similar to the iPhone 5 screen, being a 4-inch capacitive touchscreen with retina display. It comes with an iSight 5MP camera having a flash. This is the thinnest iPod Touch, being just 6.1mm in thickness and it weighs just 88gm. The 5MP camera has a support for 1080p video recording with video image stabilization, face detection and the panorama feature for capturing wide photos. The iPod Touch 5G has got the iOS 6 operating system with more than 200 changes from the previous version. The iPod Touch is coming in pink, yellow, blue, white & silver, black & slate colors. Both the iPods, just like the iPhone, would come with the Lightning connector enhancing the connectivity and the Lightning comes with an adapter. The all-digital Lightning connector features an adaptive interface that uses only the signals that each accessory requires, and it’s reversible so you can instantly connect to your accessories. Apple iPod shuffle is available today in pink, yellow, blue, green, purple, silver and slate for a suggested price of INR 3,700 inc VAT (INR 3,260 ex VAT) in a 2GB model through Apple Authorized Resellers in India, and for $49 USD in the U.S.